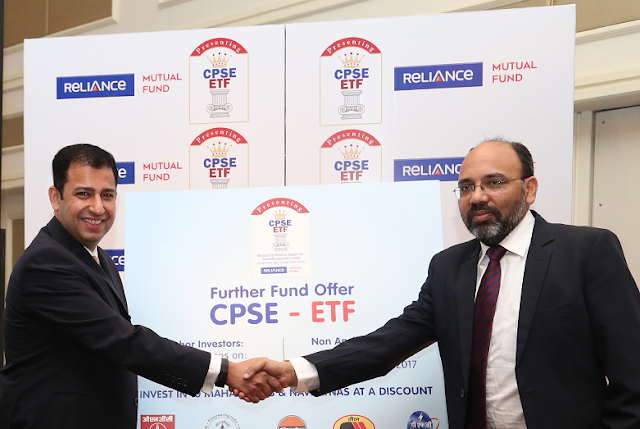 INDIA, January 13, 2017: Reliance Mutual Fund (RMF), a part of Reliance Capital, today announced Further Fund Offer (FFO) of its Central Public Sector Enterprises - Exchange Traded Fund (CPSE ETF). This FFO is part of the Government of India’s overall disinvestment program, announced earlier by the Department of Investment and Public Asset Management (DIPAM), Ministry of Finance, using the ETF route. Reliance Mutual Fund proposes to raise upto Rs. 4,500 crore (US$ 671 million) in this FFO with an option to retain oversubscription upto Rs. 1,500 crore (US$ 235.5 million). “The Further Fund Offer in the CPSE ETF is part of the government’s larger disinvestment program that was announced earlier by the Ministry of Finance. We feel confident that the timing of the issue will help investors benefit from their exposure in a diversified basket like CPSE ETF that includes a list of distinguished PSUs that have performed exceedingly well in their respective sectors. We are confident of an overwhelming response to this FFO”, said Mr Manish Singh, Joint Secretary, DIPAM, Ministry of Finance. “We are delighted to announce the CPSE ETF FFO. It offers a compelling opportunity for investors, especially retail and retirement funds, to invest in the India growth story at an attractive valuation, lowest expense and embedded discounts”, said Mr Sundeep Sikka, ED and CEO, Reliance Nippon Life Asset Management. The FFO is open for all category of investors including Anchor Investors, Retail Investors, Retirement Funds, QIBs, Non-institutional investors and Foreign Portfolio Investor (FPIs). As part of the FFO, an upfront discount of 5% is being offered to all category of investors. The dividend yield of Nifty CPSE Index is approx 4%, further adding to the overall merit of investing in this ETF. In addition, CPSE ETF has an expense ratio of 6.5 bps, which is much lower than the other non-ETF that have an expense as high as upto 200 bps. The FFO will be open for investors from January 17, 2017 till January 20, 2017. “We would like to reach out to retirement funds that can now invest in ETFs as per the revised norms, to consider this as an opportunity to secure their funds and benefit from the growth of these PSUs - some of which are Navratnas, Maharatnas and are either sector leaders or near monopolies in their respective sectors”, said Mr Sikka. DIPAM has appointed ICICI Securities Limited as the advisor for the FFO. CPSE ETF is a passive investment fund that was created to help the government in its disinvestment program of divesting stake in select Central Public Sector Enterprises (CPSE) through Exchange Traded Funds (ETF). The fund invests in the Nifty CPSE Index stocks – that includes ten PSU companies selected on the basis of established track record, government holding, market capitalisation, dividend history, sector representation, etc. - in the same proportion and weightage as of the index. The CPSE ETF was launched in March 2014 through a New Fund Offer (NFO) with an issue size of Rs. 3,000 crore (US$ 447 million). The NFO received an overwhelming response across all category of investors and was oversubscribed by over Rs. 1,300 crore (US$ 194 million). The ETF went live on April 4, 2014 and got listed on both NSE and BSE.